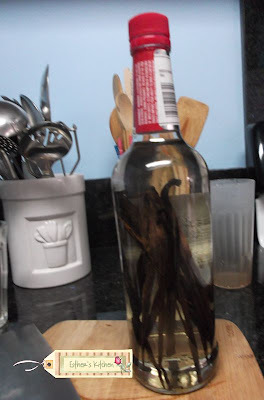 My mom sent me vanilla beans so I could make my own vanilla extract. I found a very easy recipe here. So today, I made vanilla extract. Remove approximately 1/4 cup of the vodka from the bottle. With a sharp knife (I used a sharp cleaver) slice the vanilla beans lengthwise. Add the the vodka in the bottle. Shake and put in a cool dark place for approximately 2 to 3 months. The instructions indicate that we should shake the bottle at least once a week. All this extract will surely come in handy for cookie making season...i.e. Christmas!